Baby jack fruits sell like hot cakes in UP. At least in the eastern part of UP, baby jack fruits are the first jack fruits to appear in the local markets and they are lapped up by vegetarians who want to eat meaty vegetables. Jack fruit is the one meaty vegetable they depend upon the most. Baby jack fruits are called as katahari or ledha kathal in UP and Bihar too. 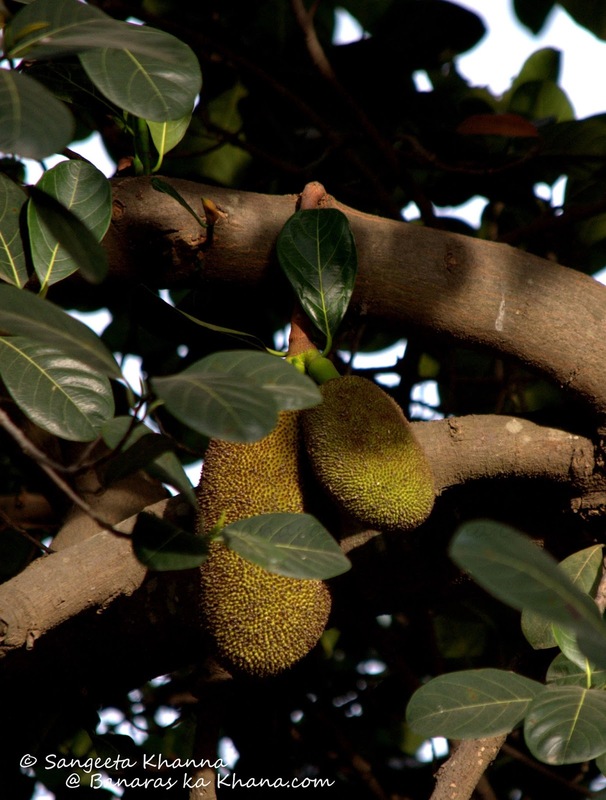 In Bengal it is known as Ganchh pantha, meaning meat growing on a tree. It is a pity I have not shared many recipes of jack fruit here on this blog, although it is a very popular vegetable in Banaras and people cook it is many different ways. Of course each home has a different recipe but jack fruit is mostly cooked just like meats, using the same procedures of slow cooking, dum cooking and stewing etc to make the most of the meatiness it has. This achari kathal is also a spin off of mutton achari. Normally it is cooked with loads of mustard oil and looks shiny and oily with oil floating in the bowl. I would of course make it more suitable for everyday consumption. You can see there is very little oil used to make this achari kathal. We don't get baby jack fruits here in Delhi and I was talking about this to a colleague of the husband long back. And then someone rang up the bell early in the morning one day, we found the gentleman with 2 baby jack fruits in a bag at our doorstep. How sweet of him to bring baby jackfruits from his own orchards back in UP, from his visit. I got them cleaned and cubed, then cooked this achari kathal and froze the rest. Will be coming up with more recipes soon. Normally the baby jackfruit cubes will be deep fried in mustard oil and then cooked along with a gravy but that becomes a really heavy subzi which is okay once in a while. I don't deep fry things much these days as I find it too heavy for my taste, more so because I want to eat more of the subzi. So the low oil quick method is what I am going to share. The subzi doesn't look rich and oily but it is definitely tasty. Heat oil in a pressure cooker pan and tip in the hing, cumin, nigella and mustard seeds along with broken red chillies. Let them all splutter and get the chillies smoked a bit. Add the cubed baby jack fruit and toss and cook for 5 minutes or so. Mix all the powdered spices with the yogurt and whisk in the mean time. Now pour the whisked yogurt spice mix, into the cooking subzi, stir to mix well, add 1/2 cup water and salt and close the lid with the pressure vent. Let it cook on high till the first whistle blows. Then lower the heat and cook further for 10 minutes. Cool the pressure cooker till the pressure gets down, open the lid and adjust consistency. I like it dry so I reduce the watery liquid. 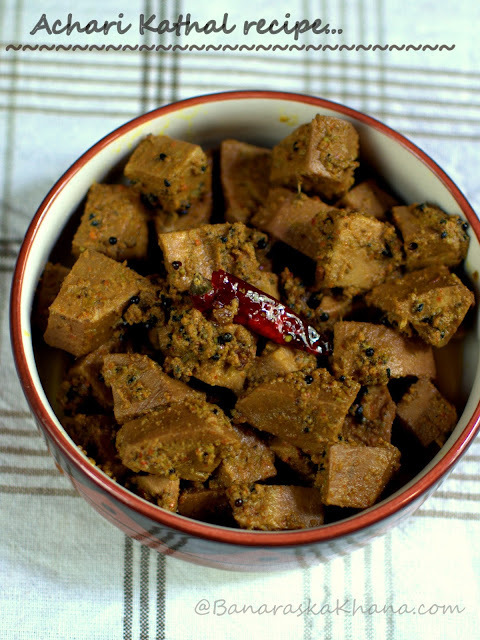 Serve the achari kathal ki subzi hot, warm or at room temperature. Sometimes I empty the cooker (or pan) and quickly cook another vegetable in it with the remaining grease. The beans on the side were just added with a little salt and cooked till the pressure just starts building up. This way I get some greens too for the meal. 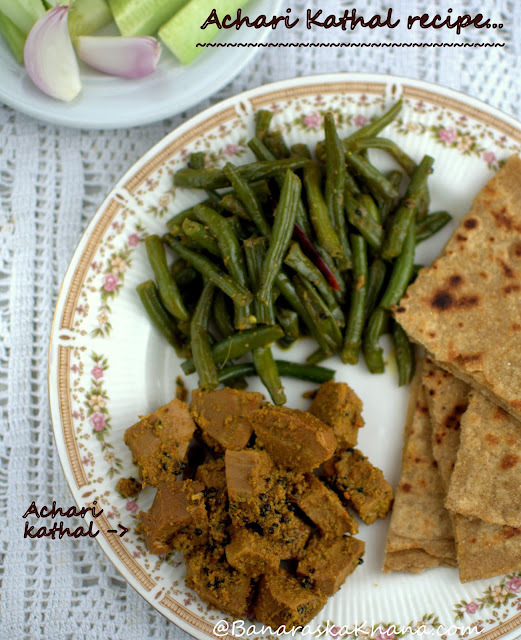 A multi grain paratha suits achari kathal the best. Make it crisp and see how it becomes a meal that you love. I have shared kathal ka dopyaza, kathal ki sookhi masaledar subzi, kathal ki biryani in the past and am sharing kathal ki bhujia and more recipes with kathal soon. I have the pictures clicked when I cooked them but somehow couldn't share them here. 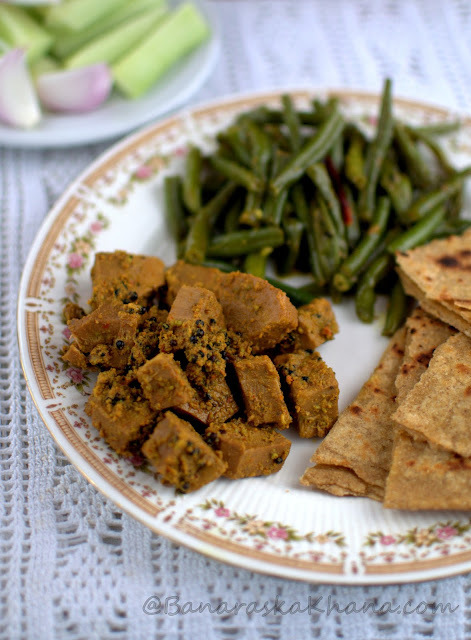 I wish I could have more time to talk about these desi khana more and more. Kathal is available all over the year in Delhi, it keeps coming to the market from some or the other part of the country and thanks to the varied geographic-climatic conditions we do get almost everything all year round. Not such a thing to boast about but it will be better if we eat the produce of our own country and not start jumping at imported produce. Carbon footprint is not something to be happy about. Kathal is cool, red currants, blueberries and blackberries are not.